This article is about the 1936–38 Soviet purge. For the general article about political purges, see Purge. The Great Purge or the Great Terror (Russian: Большой террор) was a campaign of political repression in the Soviet Union which occurred from 1936 to 1938. It involved a large-scale purge of the Communist Party and government officials, repression of wealthy landlords and the Red Army leadership, widespread police surveillance, suspicion of saboteurs, counter-revolutionaries, imprisonment, and arbitrary executions. In Russian historiography, the period of the most intense purge, 1937–1938, is called Yezhovshchina (literally, "Yezhov phenomenon",[note 1] commonly translated as "times of Yezhov" or "doings of Yezhov"), after Nikolai Yezhov, the head of the Soviet secret police, the NKVD, who was executed a year after the purge. Modern historical studies estimate the total number of deaths due to Stalinist repression in 1937–38 to be between 681,692-1,200,000. In the Western world, Robert Conquest's 1968 book The Great Terror popularized that phrase. Conquest's title was in turn an allusion to the period called the Reign of Terror during the French Revolution (French: la Terreur, and, from June to July 1794, la Grande Terreur, the Great Terror). 5.2 Ex-kulaks and other "anti-Soviet elements"
The term "repression" was officially used to describe the prosecution of people considered counter-revolutionaries and enemies of the people by the leader of the Soviet Union at the time, Joseph Stalin. The purge was motivated by the desire to remove dissenters from the Communist Party and to consolidate the authority of Stalin. Most public attention was focused on the purge of certain parts of the leadership of the Communist Party, as well as of government bureaucrats and leaders of the armed forces, most of whom were Party members. The campaigns also affected many other categories of the society: intelligentsia, peasants and especially those branded as "too rich for a peasant" (kulaks), and professionals. A series of NKVD operations affected a number of national minorities, accused of being "fifth column" communities. A number of purges were officially explained as an elimination of the possibilities of sabotage and espionage, by the Polish Military Organisation and, consequently, many victims of the purge were ordinary Soviet citizens of Polish origin. According to Nikita Khrushchev's 1956 speech, "On the Cult of Personality and its Consequences," and Robert Conquest, a great number of accusations, notably those presented at the Moscow show trials, were based on forced confessions, often obtained through torture, and on loose interpretations of Article 58 of the RSFSR Penal Code, which dealt with counter-revolutionary crimes. Due legal process, as defined by Soviet law in force at the time, was often largely replaced with summary proceedings by NKVD troikas. The Great Purge began under NKVD chief Genrikh Yagoda, but reached its peak between September 1936 and August 1938 under the leadership of Nikolai Yezhov, hence the name Yezhovshchina. The campaigns were carried out according to the general line, often by direct orders of the Party Politburo headed by Stalin. From 1930 onwards, the Party and police officials feared the "social disorder" caused by the upheavals of forced collectivization of peasants and the resulting famine of 1932–1933, as well as the massive and uncontrolled migration of millions of peasants into cities. The threat of war heightened Stalin's perception of marginal and politically suspect populations as the potential source of an uprising in case of invasion. He began to plan for the preventive elimination of such potential recruits for a mythical "fifth column of wreckers, terrorists and spies." (Hagenloh, 2000; Shearer, 2003). Leon Trotsky, in 1929, shortly before being driven out of the Soviet Union. The term "purge" in Soviet political slang was an abbreviation of the expression purge of the Party ranks. In 1933, for example, the Party expelled some 400,000 people. But from 1936 until 1953, the term changed its meaning, because being expelled from the Party came to mean almost certain arrest, imprisonment, and often execution. The political purge was primarily an effort by Stalin to eliminate challenge from past and potential opposition groups, including the left and right wings led by Leon Trotsky and Nikolai Bukharin, respectively. Following the Civil War and reconstruction of the Soviet economy in the late 1920s, veteran Bolsheviks no longer thought necessary the "temporary" wartime dictatorship, which had passed from Lenin to Stalin. Stalin's opponents on both sides of the political spectrum chided him as undemocratic and lax on bureaucratic corruption. This opposition to current leadership may have accumulated substantial support among the working class by attacking the privileges and luxuries the state offered to its high-paid elite. The Ryutin Affair seemed to vindicate Stalin's suspicions. He enforced a ban on party factions and banned those party members who had opposed him, effectively ending democratic centralism. In the new form of Party organization, the Politburo, and Stalin in particular, were the sole dispensers of ideology. This required the elimination of all Marxists with different views, especially those among the prestigious "old guard" of revolutionaries. As the purges began, the government (through the NKVD) shot Bolshevik heroes, including Mikhail Tukhachevsky and Béla Kun, as well as the majority of Lenin's Politburo, for disagreements in policy. The NKVD attacked the supporters, friends, and family of these "heretical" Marxists, whether they lived in Russia or not. The NKVD nearly annihilated Trotsky's family before killing him in Mexico; the NKVD agent Ramón Mercader was part of an assassination task force put together by Special Agent Pavel Sudoplatov, under the personal orders of Stalin. Leningrad party leader Sergei Kirov with Stalin (and his daughter Svetlana) in 1934. In 1934, Stalin used the murder of Sergey Kirov as a pretext to launch the Great Purge, in which about a million people perished (see § Number of people executed). Some later historians came to believe that Stalin arranged the murder, or at least that there was sufficient evidence to reach such a conclusion. Kirov was a staunch Stalin loyalist, but Stalin may have viewed him as a potential rival because of his emerging popularity among the moderates. The 1934 Party Congress elected Kirov to the central committee with only three votes against, the fewest of any candidate, while Stalin received 292 votes against. After Kirov's assassination, the NKVD charged the former oppositionists, an ever-growing group according to their determination, with Kirov's murder as well as a growing list of other offences, including treason, terrorism, sabotage, and espionage. Another justification for the purge was to remove any possible "fifth column" in case of a war. Vyacheslav Molotov and Lazar Kaganovich, participants in the repression as members of the Politburo, maintained this justification throughout the purge; they each signed many death lists. Stalin believed war was imminent, threatened both by an explicitly hostile Germany and an expansionist Japan. The Soviet press portrayed the country as threatened from within by fascist spies. From the October Revolution onward, Lenin had used repression against perceived enemies of the Bolsheviks as a systematic method of instilling fear and facilitating social control, especially during the campaign commonly referred to as the Red Terror. This policy continued and intensified under Stalin, periods of heightened repression including the deportation of kulaks who opposed collectivization, and a severe famine in Ukraine. A distinctive feature of the Great Purge was that, for the first time, members of the ruling party were included on a massive scale as victims of the repression. Due to the scale of the terror, the substantial victims of the purges were Communist Party members and office-holders. The purge of the Party was accompanied by the purge of the whole society. The following events are used for the demarcation of the period. The first Moscow Trial, 1936. 1937, introduction of NKVD troikas for implementation of "revolutionary justice". 1937, passage of Article 58-14 about "counter-revolutionary sabotage". Between 1936 and 1938, three very large Moscow Trials of former senior Communist Party leaders were held, in which they were accused of conspiring with fascist and capitalist powers to assassinate Stalin and other Soviet leaders, dismember the Soviet Union and restore capitalism. These trials were highly publicized and extensively covered by the outside world, which was mesmerized by the spectacle of Lenin's closest associates confessing to most outrageous crimes and begging for death sentences. The first trial was of 16 members of the so-called "Trotskyite-Kamenevite-Zinovievite-Leftist-Counter-Revolutionary Bloc", held in August 1936, at which the chief defendants were Grigory Zinoviev and Lev Kamenev, two of the most prominent former party leaders. Among other accusations, they were incriminated with the assassination of Kirov and plotting to kill Stalin. After confessing to the charges, all were sentenced to death and executed. The second trial in January 1937 involved 17 lesser figures known as the "anti-Soviet Trotskyite-centre" which included Karl Radek, Yuri Piatakov and Grigory Sokolnikov, and were accused of plotting with Trotsky, who was said to be conspiring with Germany. Thirteen of the defendants were eventually executed by shooting. The rest received sentences in labor camps where they soon died. There was also a secret trial before a military tribunal of a group of Red Army commanders, including Mikhail Tukhachevsky, in June 1937. Some Western observers who attended the trials said that they were fair and that the guilt of the accused had been established. They based this assessment on the confessions of the accused, which were freely given in open court, without any apparent evidence that they had been extracted by torture or drugging. The British lawyer and Member of Parliament D.N. Pritt, for example, wrote: "Once again the more faint-hearted socialists are beset with doubts and anxieties", but "once again we can feel confident that when the smoke has rolled away from the battlefield of controversy it will be realized that the charge was true, the confessions correct and the prosecution fairly conducted". It is now known that the confessions were given only after great psychological pressure and torture had been applied to the defendants. From the accounts of former OGPU officer Alexander Orlov and others, the methods used to extract the confessions are known: such tortures as repeated beatings, simulated drownings, making prisoners stand or go without sleep for days on end, and threats to arrest and execute the prisoners' families. For example, Kamenev's teenage son was arrested and charged with terrorism. After months of such interrogation, the defendants were driven to despair and exhaustion. Zinoviev and Kamenev demanded, as a condition for "confessing", a direct guarantee from the Politburo that their lives and that of their families and followers would be spared. This offer was accepted, but when they were taken to the alleged Politburo meeting, only Stalin, Kliment Voroshilov, and Yezhov were present. Stalin claimed that they were the "commission" authorized by the Politburo and gave assurances that death sentences would not be carried out. After the trial, Stalin not only broke his promise to spare the defendants, he had most of their relatives arrested and shot. 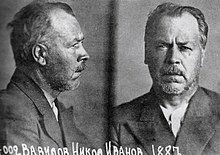 The chief executioner of the NKVD, Vasili Blokhin, carried out some of the high-profile executions during the purges. In May 1937, the Commission of Inquiry into the Charges Made against Leon Trotsky in the Moscow Trials, commonly known as the Dewey Commission, was set up in the United States by supporters of Trotsky, to establish the truth about the trials. The commission was headed by the noted American philosopher and educator John Dewey. Although the hearings were obviously conducted with a view to proving Trotsky's innocence, they brought to light evidence which established that some of the specific charges made at the trials could not be true. For example, Georgy Pyatakov testified that he had flown to Oslo in December 1935 to "receive terrorist instructions" from Trotsky. The Dewey Commission established that no such flight had taken place. Another defendant, Ivan Smirnov, confessed to taking part in the assassination of Sergei Kirov in December 1934, at a time when he had already been in prison for a year. That the conduct of the Moscow Trials was such as to convince any unprejudiced person that no attempt was made to ascertain the truth. That while confessions are necessarily entitled to the most serious consideration, the confessions themselves contain such inherent improbabilities as to convince the Commission that they do not represent the truth, irrespective of any means used to obtain them. That Trotsky never instructed any of the accused or witnesses in the Moscow trials to enter into agreements with foreign powers against the Soviet Union [and] that Trotsky never recommended, plotted, or attempted the restoration of capitalism in the USSR. The commission concluded: "We therefore find the Moscow Trials to be frame-ups." In the second trial, Karl Radek provided (or more accurately was forced to provide) the pretext for greater purge to come on a massive scale with his testimony that there was a "third organization separate from the cadres which had passed through [Trotsky's] school" as well as "semi-Trotskyites, quarter-Trotskyites, one-eighth-Trotskyites, people who helped us, not knowing of the terrorist organization but sympathizing with us, people who from liberalism, from a Fronde against the Party, gave us this help." I feel guilty of one thing more: even after admitting my guilt and exposing the organisation, I stubbornly refused to give evidence about Bukharin. I knew that Bukharin's situation was just as hopeless as my own, because our guilt, if not juridically, then in essence, was the same. But we are close friends, and intellectual friendship is stronger than other friendships. I knew that Bukharin was in the same state of upheaval as myself. That is why I did not want to deliver him bound hand and foot to the People's Commissariat of Home Affairs. Just as in relation to our other cadres, I wanted Bukharin himself to lay down his arms. 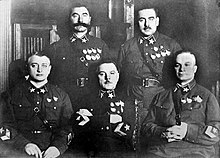 NKVD chiefs responsible for conducting mass repressions: From l. to r.: Yakov Agranov; Genrikh Yagoda; unknown; Stanislav Redens. All three were themselves eventually arrested and executed. The third and final trial, in March 1938, known as The Trial of the Twenty-One, is the most famous of the Soviet show trials, because of persons involved and the scope of charges which tied together all loose threads from earlier trials. Meant to be the culmination of previous trials, it included 21 defendants alleged to belong to the so-called "Bloc of Rightists and Trotskyites", led by Nikolai Bukharin, the former chairman of the Communist International, former premier Alexei Rykov, Christian Rakovsky, Nikolai Krestinsky and Genrikh Yagoda, recently disgraced head of the NKVD. The fact that Yagoda was one of the accused showed the speed at which the purges were consuming their own. It was now alleged that Bukharin and others sought to assassinate Lenin and Stalin from 1918, murder Maxim Gorky by poison, partition the U.S.S.R and hand her territories to Germany, Japan, and Great Britain, and other preposterous charges. Even previously sympathetic observers who had stomached the earlier trials found it harder to swallow these new allegations as they became ever more absurd, and the purge expanded to include almost every living Old Bolshevik leader except Stalin. No other crime of the Stalin years so captivated Western intellectuals as the trial and execution of Bukharin, who was a Marxist theorist of international standing. For some prominent communists such as Bertram Wolfe, Jay Lovestone, Arthur Koestler, and Heinrich Brandler, the Bukharin trial marked their final break with communism, and even turned the first three into fervent anti-Communists eventually. To them, Bukharin's confession symbolized the depredations of communism, which not only destroyed its sons but also conscripted them in self-destruction and individual abnegation. The preparation for this trial, which took over a year, was delayed in its early stages due to the reluctance of some party members to denounce their comrades. It was at this time that Stalin personally intervened to speed up the process and replaced Yagoda with Yezhov. On the first day of trial, Krestinsky caused a sensation when he repudiated his written confession and pleaded not guilty to all the charges. However, he changed his plea the next day after "special measures", which dislocated his left shoulder among other things. Anastas Mikoyan and Vyacheslav Molotov later claimed that Bukharin was never tortured, but it is now known that his interrogators were given the order, "beating permitted," and were under great pressure to extract confession out of the "star" defendant. Bukharin initially held out for three months, but threats to his young wife and infant son, combined with "methods of physical influence" wore him down. But when he read his confession amended and corrected personally by Stalin, he withdrew his whole confession. The examination started all over again, with a double team of interrogators. Bukharin's confession in particular became subject of much debate among Western observers, inspiring Koestler's acclaimed novel Darkness at Noon and philosophical essay by Maurice Merleau-Ponty in Humanism and Terror. His confessions were somewhat different from others in that while he pleaded guilty to "sum total of crimes", he denied knowledge when it came to specific crimes. Some astute observers noted that he would allow only what was in written confession and refuse to go any further. The result was a curious mix of fulsome confessions (of being a "degenerate fascist" working for "restoration of capitalism") and subtle criticisms of the trial. After disproving several charges against him, one observer noted that Bukharin "proceeded to demolish or rather showed he could very easily demolish the whole case." He continued by saying that "the confession of the accused is not essential. The confession of the accused is a medieval principle of jurisprudence" in a trial that was solely based on confessions, he finished his last plea with the words: "the monstrousness of my crime is immeasurable especially in the new stage of struggle of the U.S.S.R. May this trial be the last severe lesson, and may the great might of the U.S.S.R. become clear to all." Romain Rolland and others wrote to Stalin seeking clemency for Bukharin, but all the leading defendants were executed except Rakovsky and two others (who were killed in NKVD prisoner massacres in 1941). Despite the promise to spare his family, Bukharin's wife, Anna Larina, was sent to a labor camp, but she survived to see her husband rehabilitated by the Soviet state under Mikhail Gorbachev in 1988. 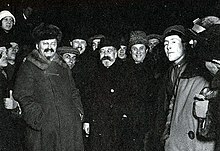 The first five Marshals of the Soviet Union in November 1935. (l-r): Mikhail Tukhachevsky, Semyon Budyonny, Kliment Voroshilov, Vasily Blyukher, Aleksandr Yegorov. Only Voroshilov and Budyonny survived the Great Purge. The purge of the Red Army and Military Maritime Fleet removed three of five marshals (then equivalent to four-star generals), 13 of 15 army commanders (then equivalent to three-star generals), eight of nine admirals (the purge fell heavily on the Navy, who were suspected of exploiting their opportunities for foreign contacts), 50 of 57 army corps commanders, 154 out of 186 division commanders, 16 of 16 army commissars, and 25 of 28 army corps commissars. At first it was thought 25–50% of Red Army officers had been purged; the true figure is now known to be in the area of 3.7–7.7%. This discrepancy was the result of a systematic underestimation of the true size of the Red Army officer corps, and it was overlooked that most of those purged were merely expelled from the Party. Thirty percent of officers purged in 1937–39 were allowed to return to service. The purge of the army was claimed to be supported by German-forged documents (said to have been correspondence between Marshal Tukhachevsky and members of the German high command). The claim is unsupported by facts, as by the time the documents were supposedly created, two people from the eight in the Tukhachevsky group were already imprisoned, and by the time the document was said to reach Stalin the purging process was already underway. However the actual evidence introduced at trial was obtained from forced confessions. Eventually almost all of the Bolsheviks who had played prominent roles during the Russian Revolution of 1917, or in Lenin's Soviet government, were executed. Out of six members of the original Politburo during the 1917 October Revolution who lived until the Great Purge, Stalin himself was the only one who remained in the Soviet Union, alive. Four of the other five were executed. The fifth, Leon Trotsky, had been forced into exile outside the Soviet Union in 1929, but was assassinated in Mexico by Soviet agent Ramón Mercader in 1940. 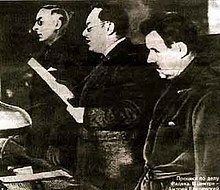 Of the seven members elected to the Politburo between the October Revolution and Lenin's death in 1924, four were executed, one (Tomsky) committed suicide and two (Molotov and Kalinin) lived. However, the trials and executions of the former Bolshevik leaders, while being the most visible part, were only a minor part of the purges. A series of documents discovered in the Central Committee archives in 1992 by Vladimir Bukovsky demonstrate that there were quotas for arrests and executions as for all other activities in the planned economy. The victims were convicted in absentia and in camera by extra-judicial organs – the NKVD troikas sentenced indigenous «enemies» under NKVD Order no. 00447 and the two-man dvoiki (NKVD Commissar Nikolai Yezhov and Main State Prosecutor Andrey Vyshinsky, or their deputies) those arrested along «national» lines. A characteristic of all the mass operations of the NKVD was flexibility: first, the numbers – the so-called limit – could be easily increased; second, it was left entirely to the NKVD officers whether a particular prisoner was to be shot or sent to the prison camps; third, the time-limits set for the completion of single operations were extended time and again. The victims were executed at night, either in prisons, in the cellars of NKVD headquarters or in a secluded area, usually a forest. The NKVD officers shot prisoners in the head using pistols. 1938 NKVD arrest photo of the poet Osip Mandelstam, who died in a labor camp. The NKVD photo of writer Isaac Babel made after his arrest. 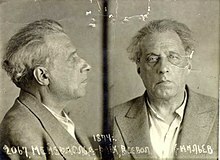 Theatre director Vsevolod Meyerhold's photo, taken at the time of his arrest. Botanist Nikolai Vavilov's photo, taken at the time of his arrest. 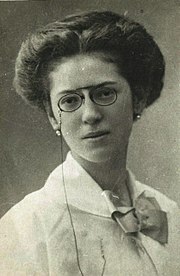 Pianist Khadija Gayibova, executed in 1938. Paleontologist and geologist Dmitrii Mushketov, executed in 1938. 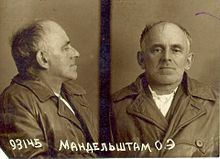 Poet Osip Mandelstam was arrested for reciting his famous anti-Stalin poem Stalin Epigram to his circle of friends in 1934. After intervention by Nikolai Bukharin and Boris Pasternak (Stalin jotted down in Bukharin's letter with feigned indignation: "Who gave them the right to arrest Mandelstam? "), Stalin instructed NKVD to "isolate but preserve" him, and Mandelstam was "merely" exiled to Cherdyn for three years, but this proved to be a temporary reprieve. In May 1938, he was promptly arrested again for "counter-revolutionary activities". On 2 August 1938, Mandelstam was sentenced to five years in correction camps and died on 27 December 1938 at a transit camp near Vladivostok. Pasternak himself was nearly purged, but Stalin is said to have crossed Pasternak's name off the list, saying "Don't touch this cloud dweller." Writer Isaac Babel was arrested in May 1939, and according to his confession paper (which contained a blood stain) he "confessed" to being a member of Trotskyist organization and being recruited by French writer André Malraux to spy for France. In the final interrogation, he retracted his confession and wrote letters to the prosecutor's office stating that he had implicated innocent people, but to no avail. Babel was tried before an NKVD troika and convicted of simultaneously spying for the French, Austrians and Trotsky, as well as "membership in a terrorist organization." On 27 January 1940, he was shot in Butyrka prison. Writer Boris Pilnyak was arrested on 28 October 1937 for counter-revolutionary activities, spying and terrorism. One report alleged that "he held secret meetings with (André) Gide, and supplied him with information about the situation in the USSR. There is no doubt that Gide used this information in his book attacking the USSR." Pilnyak was tried on 21 April 1938. In the proceeding that lasted 15 minutes, he was condemned to death and executed shortly afterward. The investigators began to use force on me, a sick 65-year-old man. I was made to lie face down and beaten on the soles of my feet and my spine with a rubber strap ... For the next few days, when those parts of my legs were covered with extensive internal hemorrhaging, they again beat the red-blue-and-yellow bruises with the strap and the pain was so intense that it felt as if boiling water was being poured on these sensitive areas. I howled and wept from the pain. I incriminated myself in the hope that by telling them lies I could end the ordeal. When I lay down on the cot and fell asleep, after 18 hours of interrogation, in order to go back in an hour's time for more, I was woken up by my own groaning and because I was jerking about like a patient in the last stages of typhoid fever. Georgian poet Titsian Tabidze was arrested on 10 October 1937 on a charge of treason and was tortured in prison. In a bitter humor, he named only the 18th-century Georgian poet Besiki as his accomplice in anti-Soviet activities. He was executed on 16 December 1937. Tabidze's lifelong friend and fellow poet, Paolo Iashvili, having earlier been forced to denounce several of his associates as the enemies of the people, shot himself with a hunting gun in the building of the Writers' Union. He witnessed and was even forced to participate in public trials that ousted many of his associates from the Writers' Union, effectively condemning them to death. When Lavrentiy Beria, chief of the Soviet security and secret police apparatus under Stalin and subsequently head of the NKVD, further pressured Iashvili with the alternatives of denouncing Tabidze or being arrested and tortured by the NKVD, Iashvili killed himself. In early 1937, poet Pavel Nikolayevich Vasiliev is said to have defended Nikolai Bukharin as "a man of the highest nobility and the conscience of peasant Russia" at the time of his denunciation at the Pyatakov Trial (Second Moscow Trial) and damned other writers then signing the routine condemnations as "pornographic scrawls on the margins of Russian literature". He was promptly shot on 16 July 1937. Jan Sten, philosopher and deputy head of the Marx-Engels Institute, was Stalin's private tutor when Stalin was trying hard to study Hegel's dialectic. (Stalin received lessons twice a week from 1925 to 1928, but he found it difficult to master even some of the basic ideas. Stalin developed enduring hostility toward German idealistic philosophy, which he called "the aristocratic reaction to the French Revolution".) In 1937, Sten was seized on the direct order of Stalin, who declared him one of the chiefs of "Menshevizing idealists". On 19 June 1937, Sten was put to death in Lefortovo prison. Poet Nikolai Klyuev was arrested in 1933 for contradicting Soviet ideology. He was shot in October 1937. Russian linguist Nikolai Durnovo, born into the Durnovo noble family, was executed on 27 October 1937. He created a classification of Russian dialects that served as a base for modern scientific linguistic nomenclature. Mari poet and playwright Sergei Chavain was executed in Yoshkar-Ola on 11 November 1937. The State prize of Mari El is named after Chavain. Ukrainian theater and movie director Les Kurbas, considered by many to be the most important Ukrainian theater director of the 20th century, was shot on 3 November 1937. Russian writer and explorer Maximilian Kravkov was arrested on a charge of his alleged participation in the "Japanese-SR Terrorist Subversive Espionage Organization". He was executed on 12 October 1937. Russian Esperanto writer and translator Nikolai Nekrasov was arrested in 1938, and accused of being "an organizer and leader of a fascist, espionage, terrorist organization of Esperantists". He was executed on 4 October 1938. Another Esperanto writer Vladimir Varankin was executed on 3 October 1938. Playwright and avant-garde poet Nikolay Oleynikov was arrested and executed for "subversive writing" on 24 November 1937. Yakut writer Platon Oyunsky, seen as one of the founders of modern Yakut literature, died in prison in 1939. Russian dramaturge Adrian Piotrovsky, responsible for creating the synopsis for Sergei Prokofiev's ballet Romeo and Juliet, was executed on 21 November 1937. Boris Shumyatsky, de facto executive producer for the Soviet film monopoly from 1930 to 1937, was executed as a "traitor" in 1938, following a purge of the Soviet film industry. Sinologist Julian Shchutsky was convicted as a "Japanese spy" and executed on 2 February 1938. Russian linguist Nikolai Nevsky, an expert on a number of East Asian languages, was arrested by the NKVD on the charge of being a "Japanese spy". On November 24, 1937 he was executed, along with his Japanese wife Isoko Mantani-Nevsky. Ukrainian drama writer Mykola Kulish was executed on 3 November 1937. He is considered to be one of the lead figures of Executed Renaissance. Ex-kulaks and other "anti-Soviet elements"
On 2 July 1937, Stalin sent a top-secret letter to all regional Party chiefs (with a copy to NKVD regional chiefs) ordering them to present, within five days, estimates of the number of kulaks and "criminals" that should be arrested, executed, or sent to camps. Produced in a matter of days, these figures roughly matched those of "suspect" individuals already under police surveillance, although the criteria used to distribute the "kulak and criminal elements" among the two categories are not clear. On 30 July 1937 the NKVD Order no. 00447 was issued, directed against "ex-kulaks" and other "anti-Soviet elements" (such as former officials of the Tsarist regime, former members of political parties other than the communist party, etc.). They were to be executed or sent to Gulag prison camps extrajudicially, under the decisions of NKVD troikas. The following categories appear to have been on index-cards, catalogues of suspects assembled over the years by the NKVD and were systematically tracked down: "ex-kulaks" previously deported to "special settlements" in inhospitable parts of the country (Siberia, Urals, Kazakhstan, Far North), former tsarist civil servants, former officers of the White Army, participants in peasant rebellions, members of the clergy, persons deprived of voting rights, former members of non-Bolshevik parties, ordinary criminals, like thieves, known to the police and various other "socially harmful elements". However, many were also arrested at random in police sweeps, or as a result of denunciations or simply because they happened to be relatives, friends or just acquaintances of people already arrested. Many railwaymen, workers, kolkhoz peasants, and engineers were arrested in the course of the Kulak Operation just because they had the misfortune of working in, or near, important strategic factories, railway or building sites, where, as a result of frantic rhythms and plans, many work accidents had occurred in previous years. In 1937–1938, the NKVD reopened these cases and systematically ascribed them to "sabotage" or "wrecking" (Werth, 2009). Yevgeny-Ludvig Karlovich Miller, one of the remaining leaders of the White movement, was kidnapped by the NKVD in 1937 and executed 19 months later. The orthodox clergy, including active parishioners, was nearly annihilated: 85% of the 35,000 members of the clergy were arrested. Particularly vulnerable to repression were also the so-called "special settlers" (spetzpereselentsy) who were under permanent police surveillance and constituted a huge pool of potential "enemies" to draw on. At least 100,000 of them were arrested in the course of the Great Terror. Common criminals such as thieves, "violators of the passport regime", etc. were also dealt with in a summary way. In Moscow, for example, nearly one third of the 20,765 persons executed on the Butovo firing range were charged with a non-political criminal offence. As soon as the Kulak Operation was launched (5 August 1937), regional party and NKVD bosses, eager to show their zeal, demanded an increase in the quotas. Accordingly, the quotas were increased. But this was not only the result of demands from below. The largest new allowances were distributed by Stalin and Yezhov on their own initiative: on 15 October 1937, for example, the Politburo passed a secret resolution increasing the number of people "to be repressed" by 120,000 (63,000 "in the first category" and 57,000 "in the second category"); on 31 January 1938, Stalin ordered a further increase of 57,200, 48,000 of whom were to be executed. 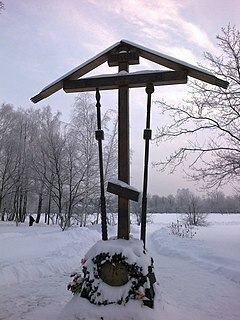 Memorial events in Bykovnya Graves reserve. The police organized sweeps and round-ups of markets or railway stations where marginals and other social outcasts were likely to be found. To carry out a growing number of arrests, the State Security personnel of NKVD – approximately 25,000 officers – were supplemented by ordinary policemen, sometimes by civilian Party or Komsomol (Young Communist League) members. Every NKVD local unit had a "casework minimum" of arrests to perform, and also of confessions to extract to "unmask conspiracies." The NKVD used uninterrupted interrogation for days on end and merciless beatings to force prisoners to confess their alleged "counter-revolutionary" crimes. To speed up the procedure, prisoners were often even forced to sign blank pages of the pre-printed interrogation folios on which the interrogator later typed up the confession. After the interrogations the files were submitted to NKVD troikas, which pronounced the verdicts in the absence of the accused. During a half-day-long session a troika went through several hundred cases, delivering either a death sentence or a sentence to the Gulag labor camps. Death sentences were immediately enforceable. The executions were carried out at night, either in prisons or in a secluded area run by the NKVD and located as a rule on the outskirts of major cities. The Kulak Operation was largest single campaign of repression in 1937–38, with 669,929 people arrested and 376,202 executed, more than half the total of known executions. Polish-born Soviet politician Stanislav Kosior, a contributor to the 1932-33 famine in Ukraine, was executed in 1939. A series of mass operations of the NKVD was carried out from 1937 through 1938 until the Soviet invasion of Poland in 1939 targeting specific nationalities within the Soviet Union, based on NKVD directives against the so-called diversionist element, according to the notion of the "hostile capitalist surrounding" as defined by Nikolai Yezhov. The Polish operation of the NKVD was the largest of this kind. Over 111,000 arrested Poles were executed. Their wives and children were dealt with by the NKVD Order № 00486. The women were sentenced to forced labour for 5 or 10 years. Their minor children were put in orphanages. All possessions were confiscated. Extended families were purposely left with nothing to live on, which usually sealed their fate as well, affecting up to 200,000–250,000 people of Polish background depending on size of their families. The NKVD national operations were conducted on a quota system using album procedure. The officials were mandated to arrest and execute a specific number of so-called "counter-revolutionaries," compiled by administration using various statistics but also telephone books with names sounding non-Russian. The Polish operation claimed the largest number of the NKVD victims: 143,810 arrests and 111,091 executions according to records. Snyder estimates that at least eighty-five thousand of them were ethnic Poles. The remainder were 'suspected' of being Polish, without further inquiry. The Polish operation served as a model for a series of similar NKVD secret decrees targeting a number of the Soviet Union's diaspora nationalities: the Finnish, Latvian, Estonian, Romanian, Greek, and Chinese. Concerning diaspora minorities, the vast majority of whom were Soviet citizens and whose ancestors had resided for decades and sometimes centuries in the Soviet Union and Russian Empire, "this designation absolutized their cross-border ethnicities as the only salient aspect of their identity, sufficient proof of their disloyalty and sufficient justification for their arrest and execution" (Martin, 2001: 338). Victims of the terror included American immigrants to the Soviet Union who had emigrated at the height of the Great Depression to find work. At the height of the Terror, American immigrants besieged the US embassy, begging for passports so they could leave the Soviet Union. They were turned away by embassy officials, only to be arrested on the pavement outside by lurking NKVD agents. Many[quantify] were subsequently shot dead at Butovo firing range. In addition, 141 American Communists of Finnish origin were executed and buried at Sandarmokh. 127 Finnish Canadians were also shot and buried there. Political prisoners already serving a sentence in the Gulag camps were also executed in large numbers. NKVD Order n°00447 also targeted “the most vicious and stubborn anti-Soviet elements in camps”, they were all “to be put into the first category” - that is shot. NKVD Order n°00447 decreed 10,000 executions for this contingent, but at least three times more were shot in the course of the secret mass operation, the majority in March-April 1938. During the late 1930s, Stalin dispatched NKVD operatives to the Mongolian People's Republic, established a Mongolian version of the NKVD troika, and proceeded to execute tens of thousands of people accused of having ties to "pro-Japanese spy rings." Buddhist lamas made up the majority of victims, with 18,000 being killed in the terror. Other victims were nobility and political and academic figures, along with some ordinary workers and herders. Mass graves containing hundreds of executed Buddhist monks and civilians have been discovered as recently as 2003. The pro-Soviet leader Sheng Shicai of Xinjiang province in China launched his own purge in 1937 to coincide with Stalin's Great Purge. The Xinjiang War (1937) broke out amid the purge. Sheng received assistance from the NKVD. Sheng and the Soviets alleged a massive Trotskyist conspiracy and a "Fascist Trotskyite plot" to destroy the Soviet Union. The Soviet Consul General Garegin Apresoff, General Ma Hushan, Ma Shaowu, Mahmud Sijan, the official leader of the Xinjiang province Huang Han-chang and Hoja-Niyaz were among the 435 alleged conspirators in the plot. Xinjiang came under virtual Soviet control. Stalin opposed the Chinese Communist Party. Reforming the security organizations, adopting official plans on purging the elites. Purging the elites; adopting plans for the mass repressions against the "social base" of the potential aggressors, starting of purging the "elites" from opposition. Mass repressions against "kulaks", "dangerous" ethnic minorities, family members of oppositionists, military officers, saboteurs in agriculture and industry. Stopping of mass operations, abolishing of many organs of extrajudicial executions, repressions against some organizers of mass repressions. In this famous image, Nikolai Yezhov is shown with Voroshilov, Molotov, and Stalin inspecting the White Sea Canal. The image was later altered to remove Yezhov completely. In the summer of 1938 Yezhov was relieved from his post as head of the NKVD and was eventually tried and executed. Lavrentiy Beria, a fellow Georgian and Stalin confidant, succeeded him as head of NKVD. 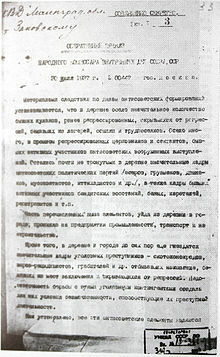 On 17 November 1938 a joint decree of Sovnarkom USSR and Central Committee of VKP(b) (Decree about Arrests, Prosecutor Supervision and Course of Investigation) and the subsequent order of NKVD undersigned by Beria, cancelled most of the NKVD orders of systematic repression and suspended implementation of death sentences. The decree signaled the end of massive Soviet purges. Nevertheless, the practice of mass arrest and exile continued until Stalin's death in 1953. Political executions also continued, but, with the exception of Katyn and other NKVD massacres during World War II, on a vastly smaller scale. One notorious example is the "Night of the Murdered Poets", in which at least thirteen prominent Yiddish writers were executed on 12 August 1952. Historians such as Michael Parrish have argued that while the Great Terror ended in 1938, a lesser terror continued in the 1940s. Aleksandr Solzhenitsyn (a Soviet Army officer who became a prisoner for a decade in the Gulag system) presents in The Gulag Archipelago the most holistic view of the timeline of all the Leninist and Stalinist purges (1918–1956), in which the 1936–38 purge may have been simply the one that got the most attention from people in a position to record its magnitude for posterity—the intelligentsia—by directly targeting them, whereas several other waves of the ongoing flow of purges, such as the 1928–33 collectivization and dekulakization, were just as huge and just as devoid of justice but were more successfully swallowed into oblivion in the popular memory of the (surviving) Soviet public. For example, in one such passage Solzhenitsyn mentions 1938 and says that 1948 was in some ways hardly better. In some cases, high military command arrested under Yezhov were later executed under Beria. Some examples include Marshal of the Soviet Union Alexander Yegorov, arrested in April 1938 and shot (or died from torture) in February 1939 (his wife, G. A. Yegorova, was shot in August 1938); Army Commander Ivan Fedko, arrested July 1938 and shot February 1939; Flagman Konstantin Dushenov [ru], arrested May 1938 and shot February 1940; Komkor G. I. Bondar, arrested August 1938 and shot March 1939. All the aforementioned have been posthumously rehabilitated. When the relatives of those who had been executed in 1937–38 inquired about their fate, they were told by NKVD that their arrested relatives had been sentenced to "ten years without the right of correspondence" (десять лет без права переписки). When these ten-year periods elapsed in 1947–48 but the arrested did not appear, the relatives asked MGB about their fate again and this time were told that the arrested died in imprisonment. Although the trials of former Soviet leaders were widely publicized, the hundreds of thousands of other arrests and executions were not. These became known in the West only as a few former gulag inmates reached the West with their stories. Not only did foreign correspondents from the West fail to report on the purges, but in many Western nations (especially France), attempts were made to silence or discredit these witnesses; according to Robert Conquest, Jean-Paul Sartre took the position that evidence of the camps should be ignored so the French proletariat would not be discouraged. A series of legal actions ensued at which definitive evidence was presented that established the validity of the former labor camp inmates' testimony. According to Robert Conquest in his 1968 book The Great Terror: Stalin's Purge of the Thirties, with respect to the trials of former leaders, some Western observers were unable to see through the fraudulent nature of the charges and evidence, notably Walter Duranty of The New York Times, a Russian speaker; the American Ambassador, Joseph E. Davies, who reported, "proof...beyond reasonable doubt to justify the verdict of treason" and Beatrice and Sidney Webb, authors of Soviet Communism: A New Civilization. While "Communist Parties everywhere simply transmitted the Soviet line", some of the most critical reporting also came from the left, notably The Manchester Guardian. The American journalist H. R. Knickerbocker also reported on the executions. He called them in 1941 "the great purges", and described how over four years they affected "the top fourth or fifth, to estimate it conservatively, of the Party itself, of the Army, Navy, and Air Force leaders and then of the new Bolshevik intelligentsia, the foremost technicians, managers, supervisors, scientists". Knickerbocker also wrote about dekulakization: "It is a conservative estimate to say that some 5,000,000 [kulaks] ... died at once, or within a few years." Evidence and the results of research began to appear after Stalin's death. This revealed the full enormity of the Purges. The first of these sources were the revelations of Nikita Khrushchev, which particularly affected the American editors of the Communist Party USA newspaper, the Daily Worker, who, following the lead of The New York Times, published the Secret Speech in full. The Great Purge was denounced by Soviet leader Nikita Khrushchev following Stalin's death. In his secret speech to the 20th CPSU congress in February 1956 (which was made public a month later), Khrushchev referred to the purges as an "abuse of power" by Stalin which resulted in enormous harm to the country. In the same speech, he recognized that many of the victims were innocent and were convicted on the basis of false confessions extracted by torture. To take that position was politically useful to Khrushchev, as he was at that time engaged in a power struggle with rivals who had been associated with the Purge, the so-called Anti-Party Group. The new line on the Great Purges undermined their power, and helped propel him to the Chairmanship of the Council of Ministers. Starting from 1954, some of the convictions were overturned. 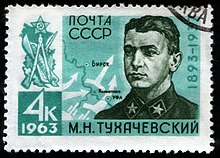 Mikhail Tukhachevsky and other generals convicted in the Trial of Red Army Generals were declared innocent ("rehabilitated") in 1957. The former Politburo members Yan Rudzutak and Stanislav Kosior and many lower-level victims were also declared innocent in the 1950s. Nikolai Bukharin and others convicted in the Moscow Trials were not rehabilitated until as late as 1988. 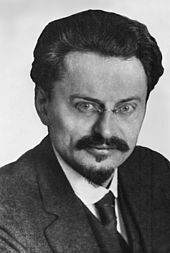 Leon Trotsky, considered a major player in the Russian Revolution and a major contributor to Marxist Theory was never rehabilitated by the USSR. The book Rehabilitation: The Political Processes of the 1930s–50s (Реабилитация. Политические процессы 30-50-х годов) (1991) contains a large amount of newly presented original archive material: transcripts of interrogations, letters of convicts, and photos. The material demonstrates in detail how numerous show trials were fabricated. Official figures put the total number of documentable executions during the years 1937 and 1938 at 681,692, whereas the total estimate of deaths brought about by Soviet repression during the Great Purge ranges from 950,000 to 1.2 million, which includes executions, deaths in detention and those who died shortly after being released from the Gulag, as a result of their treatment therein. This estimate summarises results of comparative analysis of various archival documents and, therefore, takes into account earlier arguments that official Soviet archival data may understate the actual number of deaths, be incomplete or unreliable. A common practice of falsification for lowering the execution numbers was disguising executions with the sentence ten years without the right of correspondence. All of the bodies identified from the mass graves at Vinnitsa and Kuropaty were of individuals who had received this sentence. The lower figure did roughly confirm Conquest's original 1968 estimate of 700,000 "legal" executions and in the preface to the 40th anniversary edition of The Great Terror, Conquest claimed that he had been "correct on the vital matter—the numbers put to death: about one million." Historians with archival access have confirmed that Stalin was intimately involved in the terror. Russian historian Oleg V. Khlevniuk states "…theories about the elemental, spontaneous nature of the terror, about a loss of central control over the course of mass repression, and about the role of regional leaders in initiating the terror are simply not supported by the historical record." Stalin personally directed Yezhov to torture those who were not making proper confessions. In one instance, he told Yezhov "Isn't it time to squeeze this gentleman and force him to report on his dirty little business? Where is he: in a prison or a hotel?" In another, while reviewing one of Yezhov's lists, he added to M. I. Baranov's name, "beat, beat!" According to Stalin biographer Simon Sebag Montefiore, he never attended torture sessions or executions. 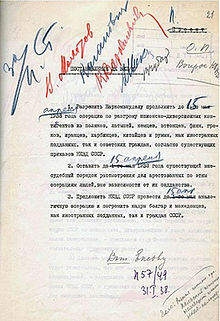 In addition to authorizing enhanced interrogation techniques, Stalin also signed 357 lists in 1937 and 1938 authorizing executions of some 40,000 people, and about 90% of these are confirmed to have been shot. While reviewing one such list, Stalin reportedly muttered to no one in particular: "Who's going to remember all this riff-raff in ten or twenty years time? No one. Who remembers the names now of the boyars Ivan the Terrible got rid of? No one." Stalin's alleged remark may be compared with Hitler's famous admonition to his generals in 1939: "Who, after all, speaks today of the annihilation of the Armenians?" Stalin undoubtedly caused many innocent people to be executed, but it seems likely that he thought many of them guilty of crimes against the state and felt that the execution of others would act as a deterent to the guilty. He signed the papers and insisted on documentation. Hitler, by contrast, wanted to be rid of the Jews and communists simply because they were Jews and communists. He was not concerned about making any pretence at legality. He was careful not to sign anything on this matter and was equally insistent on no documentation. At least two Soviet commissions investigated the show-trials after Stalin's death. The first was headed by Molotov and included Voroshilov, Kaganovich, Suslov, Furtseva, Shvernik, Aristov, Pospelov, and Rudenko. They were given the task to investigate the materials concerning Bukharin, Rykov, Zinoviev, Tukhachevsky, and others. The commission worked in 1956–1957. While stating that the accusations against Tukhachevsky et al. should be abandoned, it failed to fully rehabilitate the victims of the three Moscow trials, although the final report does contain an admission that the accusations have not been proven during the trials and "evidence" had been produced by lies, blackmail, and "use of physical influence". Bukharin, Rykov, Zinoviev, and others were still seen as political opponents, and though the charges against them were obviously false, they could not have been rehabilitated because "for many years they headed the anti-Soviet struggle against the building of socialism in USSR". In the late 1980s, with the formation of the Memorial Society and similar organisations across the Soviet Union it became possible not only to speak about the Great Terror, but also to begin locating the killing grounds of 1937-1938 and identifying those who lay buried there. In 1988, for instance, the mass graves at Kurapaty in Belarus were the site of a clash between demonstrators and the police. In 1990, a boulder stone was brought from the former Solovki prison camp in the White Sea, and erected next to KGB headquarters in Moscow as a memorial to all "the victims of political repression" since 1917. In 2007, one such site, the Butovo firing range near Moscow, was turned into a shrine to the victims of Stalinism. Between August 1937 and October 1938, more than 20,000 people were shot and buried there. On 30 October 2017, President Vladimir Putin opened the Wall of Sorrow, an official but controversial recognition of the crimes of the Soviet regime. The Great Purge has provoked numerous debates about its purpose, scale and mechanisms. According to one interpretation, Stalin's regime had to maintain its citizens in a state of fear and uncertainty to stay in power (Brzezinski, 1958). Robert Conquest emphasized Stalin's paranoia, focused on the Moscow show trial of "Old Bolsheviks", and analyzed the carefully planned and systematic destruction of the Communist Party. Some others view the Great Purge as a crucial moment – or rather the culmination – of a vast social engineering campaign started at the beginning of the 1930s (Hagenloh, 2000; Shearer, 2003; Werth, 2003). So what was the motivation behind the Terror? The answers required a lot more digging, but it gradually became clearer that the violence of the late 1930s was driven by fear. Most Bolsheviks, Stalin among them, believed that the revolutions of 1789, 1848 and 1871 had failed because their leaders hadn't adequately anticipated the ferocity of the counter-revolutionary reaction from the establishment. They were determined not to make the same mistake. Doctors' plot, a 1952–53 purge directed against mostly Jewish doctors, officials and others. Night of the Murdered Poets, the 1952 execution of thirteen Soviet Jews arrested in 1948–49. ^ According to the dictionary (Т.Ф. Ефремова Новый словарь русского языка. Толково- словообразовательный), the suffix -shchina in this case produces a word which refers to some kind of phenomenon associated with the word to which the suffix is attached. Quote: "1. Словообразовательная единица, образующая имена существительные женского рода, которые обозначают бытовое или общественное явление, идейное или политическое течение, характеризующееся признаком, названным <...>"
Juraj Sipko (Sipko J. Etnopsyholingvisticke predpoklady slovensko-ruskych a rusko-slovenskych porovnavani, Presov, 2003) comparing Russian and Slovak languages, points out that in Russian the suffix -shchina (in meaning 1 given by Efremova) most commonly bears openly negative or derisive connotations. ^ This information was published first in 1990 in a Komsomolskaya Pravda article (October 28, 1990, p.2). Later, it was cited by several sources, including Yevgenia Albats, KGB: The State Within a State. 1995, page 101; Robert Gellately. Lenin, Stalin, and Hitler: The Age of Social Catastrophe. Knopf, 2007 ISBN 1-4000-4005-1 p. 460; Catherine Merridale. Night of Stone: Death and Memory in Twentieth-Century Russia. Penguin Books, 2002 ISBN 0-14-200063-9 p. 200; Timothy J. Colton. Moscow: Governing the Socialist Metropolis. Harvard University Press, 1998, ISBN 0674587499, 9780674587496 p. 286, and Alexandr Solzhenitsyn's Two Hundred Years Together. ^ a b c Thurston, Robert W. (1998). Life and Terror in Stalin's Russia, 1934-1941. Yale University Press. p. 139. ISBN 978-0300074420. ^ Conquest 2008, p. 53. ^ Brett Homkes (2004). "Certainty, Probability, and Stalin's Great Party Purge". McNair Scholars Journal. 8 (1): 13. ^ a b c Gellately 2007. ^ Figes 2007, pp. 227–315. ^ Helen Rappaport (1999). Joseph Stalin: A Biographical Companion. ABC-CLIO. p. 110. ISBN 1576070840. Retrieved 29 September 2015. ^ Conquest 2008, pp. 250, 257–8. ^ Conquest 2008, p. 121 which cites his secret speech. ^ Conquest 2008, p. 286. ^ a b Werth, Nicolas. "Case Study:The NKVD Mass Secret Operation n° 00447 (August 1937 – November 1938)". Mass Violence and Resistance – Research Network. ^ Andrew & Mitrokhin 2000, pp. 86–7. ^ a b Conquest 1987, pp. 122–38. ^ Figes 2007, p. 239. ^ McLoughlin & McDermott 2002, p. 6. ^ Conquest 2008, p. 87. ^ Snyder 2010, p. 137. ^ Dewey, John (2008). Not guilty : report of the Commission of Inquiry Into the Charges Made Against Leon Trotsky in the Moscow Trials. 1859-1952. New York: Sam Sloan and Ishi Press International. pp. 154–155. ISBN 0923891315. OCLC 843206645. ^ Conquest 2008, p. 164. ^ Koestler 1940, p. 258. ^ Conquest 2008, p. 352. ^ Conquest 2008, p. 364–5. ^ "Ranks". goarmy.com. Retrieved 18 December 2018. ^ Conquest 2008, p. 211. ^ Courtois 1999, p. 198. ^ Stephen Lee, European Dictatorships 1918–1945, page 56. ^ Conquest 2008, pp. 198–9 (a Soviet book, Marshal Tukhachevskiy by Nikulin, pp. 189–94 is cited). ^ Conquest 2008, p. 200–2. ^ The Bukovsky Archives, "A Quota for Killings". ^ Conquest 2008, p. 295. ^ N.N. : Osip Emilevich Mandelstam, PoemHunter.com. URL. Retrieved 20 October 2007. ^ Tarkhan-Mouravi, George (19 January 1997), 70 years of Soviet Georgia. Retrieved 14 May 2007. ^ Conquest 2008, p. 301. ^ a b Snyder 2010, pp. 103–4. ^ John Earl Haynes and Harvey Klehr. American Communists and Radicals Executed by Soviet Political Police and Buried at Sandarmokh (appendix to in Denial: Historians, Communism and Espionage). ^ Haynes & Klehr 2003, p. 117. ^ Andrew D. W. Forbes (1986). Warlords and Muslims in Chinese Central Asia: a political history of Republican Sinkiang 1911–1949. Cambridge, England: CUP Archive. pp. 151, 376. ISBN 0-521-25514-7. Retrieved 31 December 2010. ^ Parrish 1996, p. 32. ^ Parrish 1996, p. 33. ^ Conquest 2008, pp. 472–3. ^ Conquest 2008, p. 472. ^ Conquest 2008, p. 472–4. ^ Conquest 2008, p. 468. ^ Conquest 2008, p. 469. ^ Conquest 2008, p. 465, 467. ^ Knickerbocker, H.R. (1941). Is Tomorrow Hitler's? 200 Questions on the Battle of Mankind. Reynal & Hitchcock. pp. 133–134. ISBN 9781417992775. ^ Getty, J. Arch; Rittersporn, Gábor; Zemskov, Viktor (1993). "Victims of the Soviet penal system in the pre-war years: a first approach on the basis of archival evidence" (PDF). American Historical Review. 98 (4): 1022. doi:10.2307/2166597. JSTOR 2166597. ^ Montefiore, Simon Sebag (2003). Stalin: The Court of the Red Tsar. London: Weidenfeld & Nicolson. p. 175. ISBN 978-1-842-12726-1. ^ Quoted in Dmitri Volkogonov, Stalin: Triumph and Tragedy (New York, 1991), pg 210. ^ Richard J. Evans (4 November 2010). "Who remembers the Poles?". London Review of Books. 32 (21). Retrieved 4 February 2012. ^ Wheatcroft 1996, p. 1348. ^ "WAR STATS REDIRECT". erols.com. ^ Harris, James (26 July 2016). "Historian James Harris says Russian archives show we've misunderstood Stalin". History News Network. Retrieved 1 December 2018. Andrew, Christopher; Mitrokhin, Vasili (2000) . The Sword and the Shield: The Mitrokhin Archive and the Secret History of the KGB. New York: Basic Books. ISBN 978-0-465-00312-9. Conquest, Robert (1973) . The Great Terror: Stalin's Purge of the Thirties (Revised ed.). London: Macmillan. ISBN 978-0-02-527560-7. Conquest, Robert (1987). Stalin and the Kirov Murder. New York: Oxford University Press. ISBN 0-19-505579-9. Harris, James (2017). The Great Fear: Stalin's Terror of the 1930s. Oxford University Press. ISBN 978-0198797869. Haynes, John Earl; Klehr, Harvey (2003). In Denial: Historians, Communism, and Espionage. Encounter Books. ISBN 1-893554-72-4. Hoffman, David L., ed. (2003). Stalinism: The Essential Readings. Oxford: Blackwell Publishers. ISBN 0-631-22890-X. Ilic, Melanie, ed. (2006). Stalin's Terror Revisited. Basingstoke: Palgrave Macmillan. Karlsson, Klas-Göran; Schoenhals, Michael (2008). Crimes against humanity under communist regimes – Research review (PDF). Forum for Living History. ISBN 978-91-977487-2-8. Archived from the original (PDF) on 24 August 2010. McLoughlin, Barry; McDermott, Kevin (2002). Stalin's Terror: High Politics and Mass Repression in the Soviet Union. Basingstoke: Palgrave Macmillan. ISBN 1-4039-0119-8. Rogovin, Vadim (1996). Two Lectures: Stalin's Great Terror: Origins and Consequences—Leon Trotsky and the Fate of Marxism in the USSR. Mehring books. ISBN 0-929087-83-6. Snyder, Timothy (2005). Sketches from a Secret War: A Polish Artist's Mission to Liberate Soviet Ukraine. New Haven, CT: Yale University Press. ISBN 978-0-300-10670-1. Snyder, Timothy (2010). Bloodlands: Europe Between Hitler and Stalin. New York: Basic Books. ISBN 0-465-00239-0 – via Google Books. Solzhenitsyn, Aleksandr I. (1973). The Gulag Archipelago, 1918–1956: In Three Volumes. New York: Harper and Row. Thurston, Robert (1998) . Life and Terror in Stalin's Russia, 1934–1941. New Haven, CT: Yale University Press. ISBN 978-0-300-07442-0. Wheatcroft, Stephen (2000). "The Scale and Nature of Stalinist Repression and its Demographic Significance: On Comments by Keep and Conquest" (PDF). Europe-Asia Studies. 52 (6): 1143–1159. doi:10.1080/09668130050143860. Yakovlev, Alexander N., ed. (1991). Реабилитация. Политические процессы 30-50-х годов [Rehabilitation: Political Trials of the 1930s–50s]. Moscow: ROSSPEN. Eternal Memory: Voices from the Great Terror. 1997. 81 minute documentary film directed by Pultz, David. Narrated by Meryl Streep. USA. Wikimedia Commons has media related to Great Purge. Genrikh Grigoryevich Yagoda, born Yenokh Gershevich Iyeguda was a secret police official who served as director of the NKVD, the Soviet Union's security and intelligence agency, from 1934 to 1936. Appointed by Joseph Stalin, Yagoda supervised the arrest, show trial, and execution of the Old Bolsheviks Lev Kamenev and Grigory Zinoviev, climactic events of the Great Purge. Yagoda supervised the construction of the White Sea–Baltic Canal with Naftaly Frenkel, using penal labor from the GULAG system, during which 12,000–25,000 laborers died. He commanded the forced collectivization and is one of the main responsible people for the great hunger in Ukraine, responsible for the deaths of up to 10 million people and the deportation of 5 million Russian and Ukrainian peasants. The Polish Operation of the Soviet security service in 1937–1938 was a mass operation of the NKVD carried out in the Soviet Union against Poles during the period of the Great Purge. It was ordered by the Politburo against the so-called "Polish spies" and customarily interpreted by the NKVD officials as relating to 'absolutely all Poles'. It resulted in the sentencing of 139,835 people, and summary executions of 111,091 Poles. 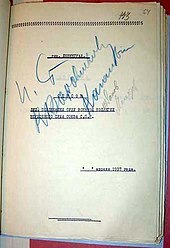 The operation was implemented according to NKVD Order № 00485 signed by Nikolai Yezhov. The majority of the shooting victims were ethnically Polish, but not all, wrote Timothy Snyder. The remainder were 'suspected' of being Polish, without further inquiry, or classed as possibly having pro-Polish sympathies. In order to speed up the process the NKVD personnel reviewed local telephone books and arrested persons with Polish-sounding names. The Soviet NKVD Order № 00485 issued on August 11, 1937 laid the foundation for the systematic elimination of the Polish minority in the Soviet Union between 1937 and 1938. The order was called "On the liquidation of Polish sabotage and espionage groups and units of the POW". It is dated August 9, 1937, was issued by the Central Committee Politburo, and signed by Nikolai Yezhov, the People's Commissar for Internal Affairs. The operation was at the center of the national operations of the NKVD, and the largest ethnically-motivated shooting action of the Great Terror. 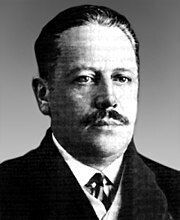 Yakov Saulovich Agranov was the first chief of Soviet Main Directorate of State Security and a deputy of NKVD chief Genrikh Yagoda. He is known as one of main organizers of Soviet political repressions and Stalinist show trials in 1920s and 1930s. He fabricated the "Tagantsev conspiracy" case and Moscow trials, including Trial of the Twenty One and Industrial Party Trial, as well as mass arrests and executions in Saint Petersburg during Stalin's Great Purge. The Stalinist repressions in Mongolia refers to a period of heightened political violence and persecution in the Mongolian People's Republic between 1937 and 1939. The repressions were part of the Stalinist purges unfolding across the Soviet Union around the same time. Soviet NKVD advisors, under the nominal direction of Mongolia's de facto leader Khorloogiin Choibalsan, persecuted individuals and organizations perceived as threats to the Mongolian revolution and the growing Soviet influence in the country. As in the Soviet Union, methods of repression included torture, show trials, executions, and imprisonment in remote forced labor camps. Estimates differ, but anywhere between 20,000 and 35,000 "enemies of the revolution" were executed, a figure representing three to five percent of Mongolia's total population at the time. Victims included those accused of espousing lamaism, pan-Mongolist nationalism, and pro-Japanese sentiment. Buddhist clergy, aristocrats, intelligentsia, political dissidents, and ethnic Buryats and Kazakhs suffered the greatest losses. The Butovo Firing Range or Butovo Shooting Range, is a former private estate near the village of Drozhzhino in Leninsky District of Moscow Oblast, near Yuzhnoye Butovo District of Moscow that was seized by the Soviets after the 1917 revolution and thereafter used by secret police as an agricultural colony, shooting range, and from 1938 to 1953, as a site for executions and mass graves of persons deemed "enemies of the people." The exact number of victims executed remains unknown, as only fragmentary data has been declassified by NKVD's successor services. However, between 1937 and 1938, the height of Josef Stalin's Great Terror, 20,761 prisoners were transported to the site and executed, typically by gunshot to the back of the head. 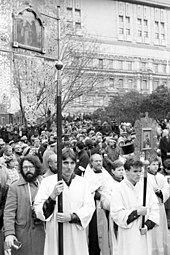 Notable victims included Béla Kun, Gustav Klutsis, Seraphim Chichagov, as well as over 1000 members of the Russian Orthodox clergy. The Russian Orthodox Church took over the ownership of the lot in 1995 and erected a large Russian Revival memorial church. The mass grave may be visited daily. About the anti-Soviet elements also known as Decision of the Politbureau of the CC of the VKP(b) No. P51/94 was a provision of the Political Bureau of the Central Committee of the Communist Party of the Soviet Union of 2 July 1937 that initiated the Great Purge. Alexander Georgievich Beloborodov was a Russian Bolshevik revolutionary, Soviet politician, and party figure. Born in Solikamsk, Perm Governorate, Russian Empire, he joined the RSDLP in 1907. After the February Revolution he became a member of the Ural Regional Party Committee, represented the Ural Bolsheviks at the Party Conference in April 1917, and became Head of the Executive Committee of the Ural Regional Soviet in January 1918. In July 1918, he ordered the execution of the former Tsar Nicholas II and his family, signing the decision by the Ural Soviet which was taken by Filipp Goloshchekin, after a final consultation with party leadership in Moscow, to deliver to Yakov Yurovsky the final orders to murder the Imperial Family.